Aero Fighters known as Sonic Wings in Japan, is a vertical-scrolling shoot 'em up arcade game originally released in 1992 by Video System and ported to the Super Nintendo Entertainment System in 1993-1994. 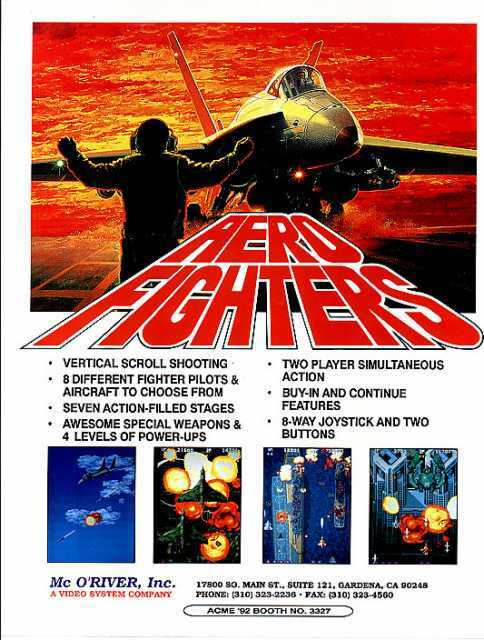 It was the first in the series of Aero Fighters video games. There are eight stages in this game. The beginning stages consists of randomly chosen areas from nations of unselected fighters (assuming those fighters have nations). If Rabio or Lepus is chosen, all four rival nation stages become playable. After completing all rival nation stages, there are four more stages. Player and team-specific endings occur after completing the first loop. After completing the 2nd loop, the ending consists of all pilot pairs giving a speech, with the second pilot in the last pair giving a cheat code. The SNES version adds hidden boss attack and time attack modes, and two hidden playable fighters, Rabio and Lepus (from Rabio Lepus, known outside of Japan as Rabbit Punch). The Japanese version does not use kanji in text as in the arcade version. In the SNES version, there are two stage loops, and the order of rival nations is fixed. In the second loop, the game's difficulty increased, except in the very hard difficulty, where the second loop is easier. The game was ported to the Super Famicom in 1993 and the Super Nintendo in 1994. An emulated version of the game was released in 2005 for the PlayStation 2 only in Japan as part of the Oretachi Geasen Zoku Sono series. What's your favorite video game character ?